For three days at the end of September, men who have been with the Passionists at some point in their lives some as high school freshmen, others at Novitiate or college, came together to share so much more than simply a reunion. There were, of course, memories shared and stories related ~ thousands of glorious stories reliving the antics and anecdotes, triumphs and failures, of teachers, fellow students, those before and after our time ~ all who make up the spirit, the charism of the Passionists. Our grateful thanks and appreciation to Al Maryan ’68, (able assistance was provided by Ray Alonzo) who put the Reunion together; from contacting the brothers, to setting up the team that found the hotel, the meeting rooms, the meals, and kept right on working down to the wire as the ice finally rattled into the drinks Friday night at the reception. Also, we would be remiss not to honor Mike Schweizer ’69, who began it all with our Warrenton Reunion in 2002, which makes him our Reunion Founding Father! Thanks for the original vision, Mike! We have lived, prayed, worked, played and grown together, all while wearing the Passionist Sign. We are brothers. We shared that brotherhood again this past September with one another and with other important people in our lives who joined us for the celebration. 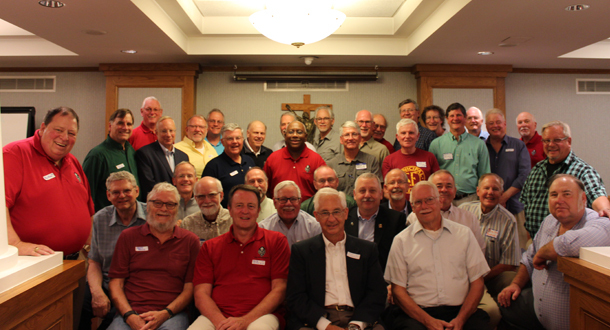 Several of our brothers have come forward to serve the Alumni community in a “Circle of Service” which, (after days of discovery, formation and prayerful consideration), has become the communication and orchestration vehicle for future reunions, gatherings, and exploration of future service opportunities for both ourselves and the Passionist family. The Circle, (the name of which is a work in progress), will begin to address a desire many have expressed for “something more” that we as lay members of the Congregation might be empowered to do. The group will also respond to a perceived need for slightly more structure for the next Reunion. Which brings us to…. Responding to the call for slightly more frequent gatherings, (ain’t nobody gettin’ no younger! ), the next Reunion will be held in Detroit in late Summer of 2019. Specifics will be coming very shortly as soon as it’s nailed down but spread the word! It will take a concerted effort to reach beyond just the brothers who have been contacted since 2002. There are hundreds more who were touched by the Passionist Charism at all levels of formation who have yet to be located. Additionally, Mark Brockman, ~ [email protected] has agreed to serve as our Tech advisor. Ray Alonzo will serve as Circle Scribe. A Passionist Family Events Team Leader will be invited to join the Circle soon. Please text or email us with any questions, thoughts, or suggestions you may have. Special thanks to Phil Jackson, and Claire Smith of the Development Office for bringing the concept of the Circle of Service to us, and to Frs. Joe Moons, John Schork and Bob Weiss (Prepsters may remember him as Fr. Marion)for taking time out of their crazy schedules to be with us in Louisville. Keep the flame alive, brothers! God bless you and those you love. Until we meet again, May the Passion of Jesus Christ be ever in our Hearts. Error: Error validating access token: Session has expired on Monday, 18-Mar-19 14:16:37 PDT. The current time is Thursday, 18-Apr-19 17:44:21 PDT.